Karen and I began our hike Saturday morning at the southern end of Duncannon, where we had completed our hike a couple of weeks ago. 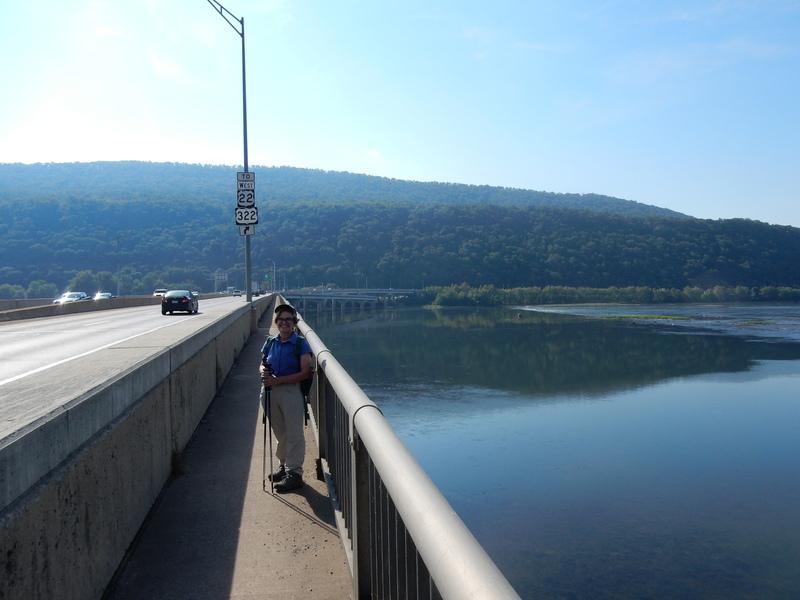 We walked all the way down Market Street, then crossed over the confluence of the Juniata and Susquehanna Rivers. By the time we crossed over the railroad tracks and started up the real (i.e., rustic) A.T., we had already walked over a mile. The climb up Peters Mountain isn’t as difficult as I had expected. The switchbacks made the ascent gradual, though not easy. There were plenty of rocks on the ascent to make the path interesting, but the real trial comes after the top of the mountain is reached. Then one has at least half a mile of scrambling over boulders. That slowed down our progress considerably. The tree leaves prevented me from getting any great views of Duncannon from the ridge. 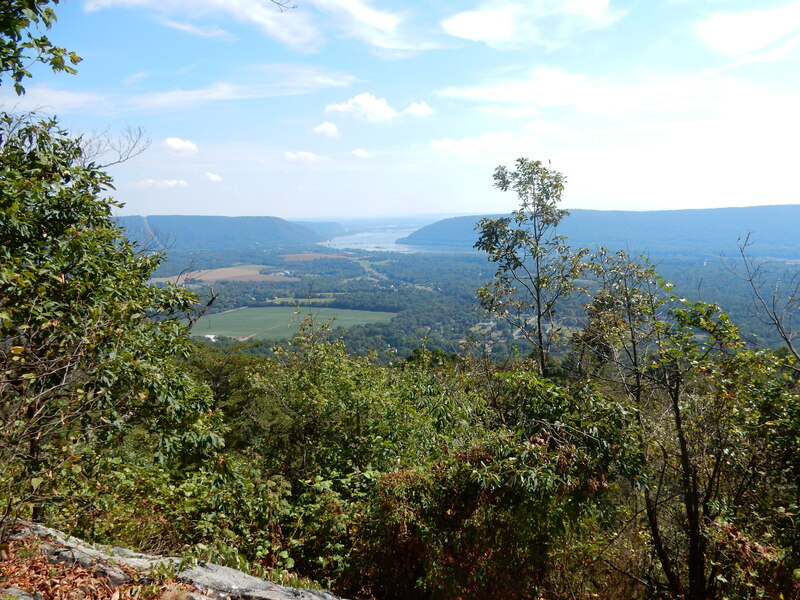 But, after we had passed Clark’s Ferry Shelter, perhaps a mile farther, the view to the south suddenly opened us before us, and we got an excellent view of the winding Susquehanna River as it meanders its way toward Harrisburg. For the record, there is an excellent tent spot just about 20 feet from this outlook. When we had about three miles farther to walk, Karen and I stopped for a coffee break. We took out our little stove, heated some water, and gave ourselves time to dry off while relaxing with a cup of hot coffee. I’m afraid this new routine of ours is going to become quite addictive. This was a great little day hike of about 7.4 miles. The sky was clear and sunny, and the temperature was in the low 80s. Tomorrow we will pick up where we left off, and Karen will continue this blog. Tod and I woke up early, ready to go for the longer, 9.6 hike. We arrived at the trail head by 8 am. It was a crisp and cool fall morning! The trail was blanketed by leaves. It couldn’t mask the fact, however, that this is still rocky terrain. Since we were already on the top of the ridge, this was a day with little altitude change. In two miles we were at Table Rock Overlook. If you don’t have vertigo, you can climb to the top rock and look down (way down!) to the sea of trees that cover the valley. What a view! Just a mile down the trail is Peter’s Mountain Shelter. It is the only shelter on the trail. We were surprised to see just how close it was to the trail and happy to see that there are places to put a tent. Although the official guide books make it sound like tent spots are non-existent, there seemed to be many unofficial (perhaps illegal?) tent spots along the way. Hiking on a ridge is really nice. The breeze felt great and the rocks – except for a short stretch near mile 6 – were not nearly as bad as yesterday. Once again, we enjoyed a coffee break at a camping spot just off the path. After the junction for Shikelimy trail, the trail begins to descend. It is a gentle incline with only a few very long switchbacks. 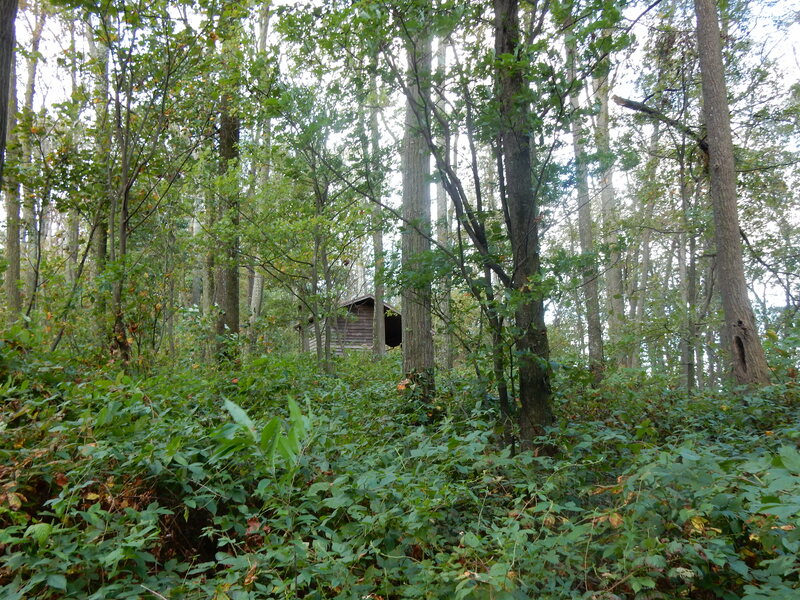 A view of the shelter from the trail. Overall, this was a much easier, much faster hike than yesterday, even though today’s hike was longer. It just goes to show that one can’t always judge a hike by mileage or even altitude. Sometimes, what isn’t on the map matters! 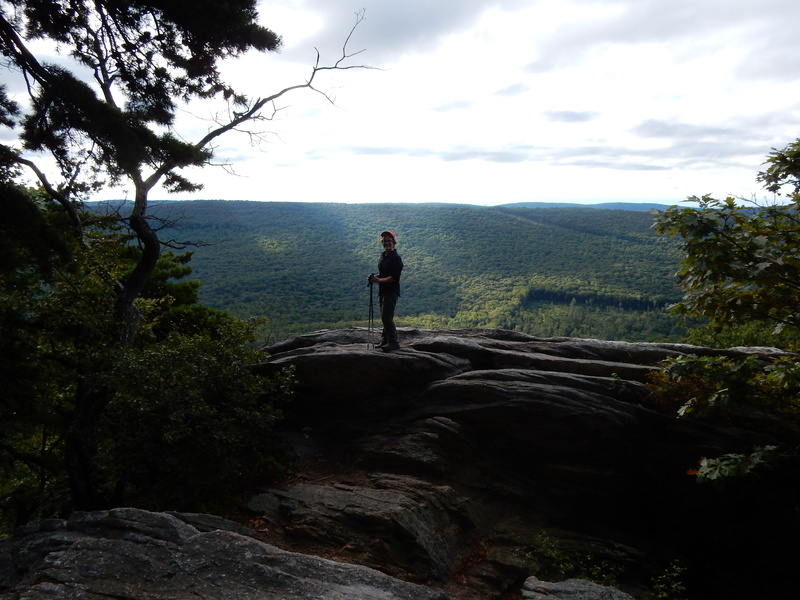 This entry was posted in Birch's Jots on Jaunts, Maple's Jots on Jaunts, Pennsylvania Hikes and tagged A.T., Appalachian Trail, Clarks Valley, day hikes, Duncannon, Pennsylvania hikes, Peters Mountain, Table Rock by Birch. Bookmark the permalink.